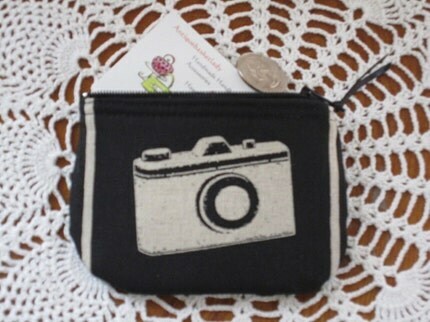 Mini Zippy Coin/Business Card case new from Antiquebasketlady...Here is the perfect little zippered pouch for coins, business card, credit cards and your ID. Great bag to slip into your pocket or to help keep your handbag organized. This purse features fabric from the designer Etsuko Furuya. This is a retro-inspired graphic print of a cameras on a black background.